If you remember, back in July I got some candles for munchkins teacher as an end of the year present. You can see pictures of them here. Ever since then I have wanted to get some for myself and I finally did. I love them so much I just had to share them here! 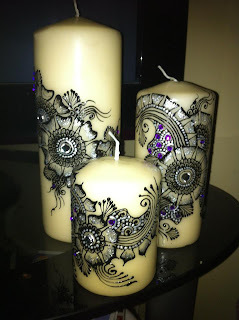 Now you would have thought these candles are pretty unmissable. Especially since I put them in front of our TV. My hubby comes home from work and settles down to watch a bit of TV. Did he notice the candles?? Not until I specifically asked him if he had noticed anything new. Then he looked around the room and finally his gaze settled on the candles. Lol about the "men" thing. So true! Love them! Definitely some to have home, where do you buy them? PS: Men always have a hard time seeing something new. You have to say it to them so they start opening their eyes. Sometime I think it's quite funny to look at them looking around wondering what is the big change! !